iTunes is a lovely application, but it's always been very one-sided -- you can sync media from iTunes to your iPod, iPhone, and iPad, but never the other way around! Thanks to today's discounted software promotion, CopyToy, you'll now be able to enjoy bi-directional copies with no hassles whatsoever! CopyToy lets you copy music, videos, photos, and even playlists from your Apple device to your PC and to iTunes! With CopyToy, moving files from one source to another is just a simple drag and drop operation, opening the door to a whole new world of media backups and data security. I mean, seriously, what does Apple expect you to do if your hard drive crashes, and you entire media collection exists only on one of your portable devices? Every little detail about each of your media files comes across when you use CopyToy to copy stuff from your iPod/iPhone/iPad to your computer. That means artist names, album names, cover art, lyrics, you name it! Plus, when was the last time you emptied out the camera roll in your iPhone? Probably never! It's high time you backed up those valuable photos to your computer, and CopyToy is just the thing you need to get it done. After you purchase CopyToy it may be used indefinitely. 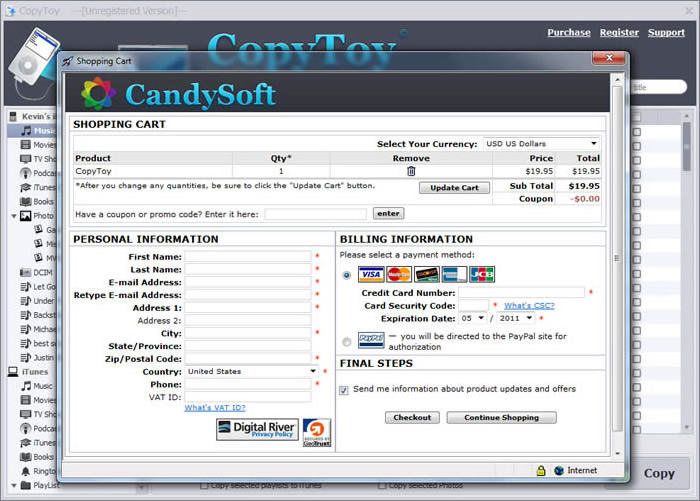 CopyToy is licensed per user, so if more people are going to use CopyToy you will need to purchase additional copies. Each license allows installation on all handheld devices, but CopyToy may not be used at exactly the same time on each of them. Kevin Li Yes, you still need to have iTunes installed on your computer, but however, the transfer has nothing to do with iTunes, you can close iTunes during the transfer. On the other hand, you need iTunes if you want to copy all iPod playlists to iTunes. Why does the PayPal checkout come to $11.96? Bob Allen buyer beware. This comes up at $10.57 on checkout. I guess the $2 is charged by paypal or VAT kinda of fee. No Name It came up the correct price for me. So it's probably a function of where you're buying from. No Name There's so much noise-to-signal on cnet download reviews, that I don't know if you can call that a review site, or even say 'reviewers'. Strange, I do not remember paying more than the shown price for any other BDJ offer. I am however looking forward to trying the software, I like the free updates. Other vendors offering similar products failed to upodate their software to support iPodTouch. VAT charges are not at all uncommon on Bits. It's a oft-misunderstood issue and there's been quite a bit of discussion here :) FYI, VAT is variable depending on the country (and non-existent in some); it would be impractical to list them all on the front page. Please note that Kevin's offer is extremely generous and by no means mandatory. It's actually *your* country that is charging the VAT, not BitsDuJour or the vendor. Kevin is taking a substantial hit on top of the discount by refunding you this fee. Garry Camps after buying with the VAT included, how do i claim the VAT refund as offered above ? Jan-Christoph Ihrens I really enjoy buying via BDJ and saving money by doing so, but letting a vendor pay my taxes - even when he kindly offers to do so - while he already sells his products at a strongly reduced price seems quite strange to me (we're talking about one or two bucks here!). I was gonna buy this and we just got home to late so I missed it by less than ten minutes. This looks like a very nice application does what it advertises, very simple and easy to use, seemed to work good in my testing earlier today. Maybe we'll catch it next time around. Wally L Not being an i* person does (at least so far anyways) can the file be transferred from an iPOD to any other MP3 type device or even just to an SD (SD-HC or SD-XC) memory card? Kevin Li hi, Walter Lindrum, since you get your music file transfer to you computer, and think it's quite easy to sync to your music player devices ranter than iPod. andrea cotillard i am at checkout right now, is there a coupon code i can plug in for cyber week?